Two neighboring Tuscan towns, both with abundant agricultural assets but a shortage of manpower, are considering merging into one. San Giovanni d’Asso, famous for its truffles, and the larger city of Montalcino (pictured) 10 miles south, known for the Brunello di Montacino wine, would combine but keep Montalcino’s name and crest. It’s not as radical as it seems: there are more than 8,000 smaller towns (comprising 10 million residents, about one-sixth of the country’s total population) in Italy, and since 2014, the government has been encouraging them to merge with each other by requiring towns with less than 5,000 people to share services or combine with nearby cities and restricting hiring to those that don’t. In addition, the Tuscan government gives 250,000€ a year to each town that merges. Still, historically, only half 20 merging initiatives have passed in the region; in all of Italy, 2,489 towns share services, but 202 have merged. San Giovanni d’Asso has just 853 residents and three city officials, and though it is not in debt, it cannot keep its municipal offices open every day of the week to provide services such as printing ID cards. The village population has been decreasing for decades as more people move to big cities, leading it to close schools, post offices, and police stations. It has attempted to share a police force and public transportation with other towns, but eventually those towns lost interest and ended the partnerships in 2014. 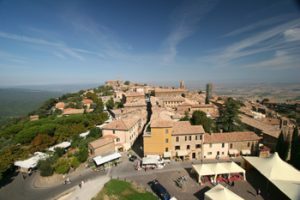 While Montalcino is larger, with a population of 5,070, its population is also declining, and the city is likely to find itself unable to deliver municipal services in the future. A merger would mean sharing 44 employees, schools, a police force, post offices, healthcare services, and about 70 miles of public roads. It would presumably streamline the governments, creating a more efficient and functional city. 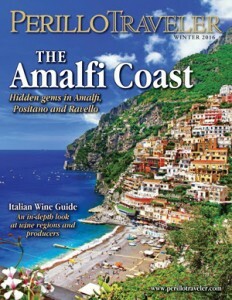 The move could also be good for tourism, as the cities could entice visitors who come in the summer for Brunello wine or in the winter for truffle season to return in the opposite season. Braconi and Montalcino Mayor Silvio Franceschelli support merging the two towns, but the decision will ultimately be up to the towns’ residents, who will vote on whether or not to approve the merger in October. Reactions from residents have been mixed, with some in favor and others afraid that both towns will lose their identities. Both mayors have met with each other as well as the Tuscan government and inhabitants of their towns. Leaders are encouraging residents to think practically about the matter.